Is There A “Blue Flame” in The House? Four years ago, my oldest daughter and I decided to fly down to see grandma (my mom) who was suffering Alzheimer’s disease. We both got a deal on super low airfare to San Diego, California and mom was to the point in her mental awareness, that if we didn’t get to see her soon, she wouldn’t know us at all. We found after arriving, she thought Karen had replaced Dianne; my wife and was upset that I had not kept her in the circle. So, her condition had worsened and afterwords, we were both glad that we had taken the trip to see her and dad both. After a couple of days, Karen and I decided that we needed a break; the routine of helping with cooking and giving dad a brief time-outs to his own sanity. It is a terrible disease to deal with during that week but for dad, it had become a real hardship and he appreciated our visit. I decided I would borrow the family ‘clunker’ of a car and show my daughter an old neighborhood where I lived between the ages of 3 and 12 years old. I had some great childhood memories there. Mature Eucalyptus trees to climb and build tree houses in, canyons to explore and fort hideouts, streets to ride bicycles and dirt alleys to shoot basketballs; thrown through an old wooden basket, nailed to a tree with the bottom knocked out of it. As we drove down Fulton Street, things had definitely changed as I suspected. It had been over thirty years since visiting the ‘old neighborhood’ and it was Karen’s first trip to the old homestead. But things had more than “changed” in appearance. I didn’t recognize the surroundings at all! No more Eucalyptus trees, no more dirt alleys and the Government Housing of multiple courts I had lived in had disappeared completely. They were all torn down and stark looking apartments had replaced the old courts. The street name was the same but that was it. I decided to see if I could find my elementary school that I had first attended in 1947, along with the junior high school; Montgomery Jr. High. As we drove by them,they were both still standing but run-down in appearance. I pulled the car over to the side of the street next to the junior high school, got out of the car and asked Karen if she wanted to take a closer look with me. “No dad, I’ll stay in the car but you go ahead.” Her interests had diminished by now, while looking at paint worn old buildings and dilapidated neighborhoods I still had a fondness for. I had the memories of what was, she wanted to please her dad for the moment, then move on. That house, located on 6980 Fulton Street, had always been my favorite house because of the memories I left there. My daughter wasn’t as interested in that house on Fulton Street; not in the same way as I was anyway. I had told her stories about my life in that house, but those tales were more than just stories to me. They were my young life locked in the memories of my favorite house. So we both decided to head back, to check-up on mom and dad. We had been away for several hours, of me reminiscing and the experience was wearing thin. When I returned to Washington state, I was having my morning devotions in the Book of Acts of my bible. At the same time, I pulled down from the book shelf Tommy Tenney’s book, God’s Favorite House. Mr. Tenney wrote about a similar experience he had with his entire family at his “favorite house” in Louisiana. This week I again was reading in the Book of Acts and the Holy Spirit prompted me to look further into the Tabernacle of David. The transition was simple since I had spent time and research in previous blogs on the Wilderness Tabernacle of Moses. “Simeon [Peter] has rehearsed how God first visited the Gentiles, to take out of them a people [to bear honor] His name. And with this the predictions of the prophets agree, as it is written. After this I will come back, and will rebuild the house of David, which has fallen; I will rebuild its [very] ruins, and I will set it up again. So that the rest of men may seek the Lord” (Acts 15:14-17–Amplified Bible; also Amos 9:11, 12). “But now your kingdom shall not continue; the Lord has sought out [David] a man after His own heart, and the Lord has commanded him to be prince and ruler over His people” (1 Samuel 13:14). “I have found David son of Jesse a man after My own heart, who will do all My will and carry out My program fully” (Acts 13:22b). 1. Three distinct enclosed areas; The outer court, the Holy Place and the Holy of Holies. 2, A great veil or drapery was stretched across the Tabernacle between the Holy Place and the Holy of Holies where the ark of the covenant rested. 3. The gold covered wooden box, originally built by Moses’ instructions given by God. 4. Its lid, fitted with sold gold figures of cherubim (two angelic figures), facing each other with outstretched wings. 5. The space between the cherubim was called “the mercy-seat”. The “mercy-seat” was where the “Blue Flame” of God’s manifested presence hovered; the “shekinah glory“. All of this hidden behind the thick four-inch fabric of the veil. He had to have it but He didn’t like it. At Mount Calvary, His Son’s body had been torn on the cross and He had ripped the veil from top to bottom located in the temple of Herod in Jerusalem. Ripped in such a way that it could never be rewoven again. God hated that veil like a prisoner hates his cell door. Previous Article “Sticks, Stones and Words”; Dealing with Hurt! December 27, 2016-got up to use the restroom and on retiring back to bed a vision of a Blueish flame in a church behind the altar and the blue flame was motioning to me. I opened my eyes wide and what in the world is this blue flame. “Go research the blue flame.” said the Voice , so I did so research on Blue Flame. God’s Glory is in the Blue Flame. It is also for the Prophet or to commission a Prophet. The Lord and I has had numerous encounters of relationship but this one is very precious as of others but very special. You see the Lord said , “Take this blue flame and I will put this blue flame in you.” i cried because I thought, why me, I am nothing. The Blue Flame as well as the Holy Spirit I guard very heavily. I love my LORD. I thank God for revealing TRUTH by His Spirit to you. You’re BLESSED! If you look at these three sources you will see where they got the Blue Flame. Patricia King admits that she was a witch. Obviously, she still is. Not unlike our physical sun (the source of all visible light that can be broken up into its seven component colors), the Solar Logos of our system too is a source of seven great cosmic Rays of spiritual light that can help accelerate our spiritual growth. These Rays build up the causal body of man, and to each of them there are various spiritual and physical qualities assigned. In this case we can say that the term “Ray” is used in a sense of one special type of force or energetic quality. These seven great streams of energy represent each and every vibration in nature, space and form, and they permeate all objects, all beings and all events in manifestation. They interpenetrate each other and combine themselves in order to produce more complex systems which we refer to as “reality”. The seven Rays surpass the possible description by words, or even by thoughts or feelings. They are too essential and all-encompassing to be limited within our own narrow inner space of perception of the great spectrum of reality. Still, certain description of these Rays is possible in terms of the corresponding qualities. Certain qualities of the Rays can be also connected to the seven chakras and to the crystals and mineral kingdom. The Blue Ray is the first Ray of light. The energy of this Flame is the first and final synthesis, the source of all the other energies. The Blue Flame is in the core of the very strength and energy. The first Ray is represented in the power of intent, cause, direction, centralization and unity, and its keynote is will – Divine Will. The basic qualities of the Blue Flame are manifested through the energies of power, strength, faith and protection. The Blue Flame Invocations should be performed on Sunday, since this is the day when the irradiation of this Ray is especially dominant. Its most prominent representative is Archangel Michael, whose magnificent appearance and presence has been preserved in the humanity’s outer consciousness, if only, unfortunately, at its periphery. Encompass yourself with the sky-blue light – the color of Archangel Michael and the ancient color of the Blue Flame. Let the Blue Ray heal you, increase your self-respect, strength and energy, and let it protect you from all the negative things that come to you. The female side of Archangel Michael’s Divine nature is Faith. Pray to Archangel Michael to be released from the emotional and other chains that bind you to other people or circumstances from the past. Pray so that you can be filled with love, and realize within yourself the power of Light. Feel this light in your heart and contribute to building a “bridge to freedom” on this path of Angels. In this endeavour you will get the help of Archangel Michael. Kindly ask Him for help while having faith in yourself, because “to him who knocks it will be opened”. Ask him to send His ascended Angels of protection to embrace you and your loved ones, and all the constructive people of Earth. Ask Him to be released from all the thoughts that are not compatible with the untainted Divine plan for you. No Angel will come, no Angel will interfere, unless you ask Him/Her to come, as this is against the Law of Divine Love. Where is the blue listed in bible? 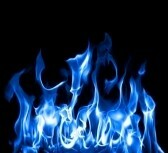 A “BLUE FLAME” is an analogy–describing the intense heat of a fire and the color “blue” being at the hottest point. Spiritually internalize that if you may, and you can perhaps understand the meaning a bit better. But if not, that’s okay too! I am sorry but it does not say blue flame; this is one of those added to the text issues. There’s no need to be “sorry” Kathleen, be a student of the Word in your understanding. For over thirty years now my sister and I have experienced the blue flame. For each of us, it was first manifest when we would press in to worship in our individual prayer closets. One day we compared notes and realized we were both having this experience. Actually we were pretty newly filled with the Spirit and just assumed everybody saw the blue flame. What I see could be compared to the appearance of the lava lights of the sixties. It’s brilliant blue and formless moving and swirling- very beautiful to see and experience. I now know many have never seen, experienced or even heard of The Blue Flame. I am humbled by this experience. Thank you Sheri for taking the time to comment on my thoughts. It is amazing to me, how much we experience in Christ, yet don’t have the confidence to share our experiences in the Holy spirit with others. “There is NO condemnation in Christ Jesus…” [paraphrased]. I have seen this Blue Flame when I was seven years old! One year ago 8-5-2012 God Showed me another vision concerning the Tabernacle of Moses with the living colours of Violet , Blue and Reds. You are BLESSED! Thank you for responding with a testimony.